Prowling the internet, filling a fantasy garage is an addictive way to kill time when you should be working, or doing laundry, or spending time with your kids. I assume that lots of the people that visit this site and its sister sites do so to save precious time: we’ve done most of the browsing for you. I’ve written about my love of the Laverda twins a couple times in the past: they’re stylish, affordable, handle well, and are relatively reliable. They’re also pretty rare, and finding parts and good mechanics to install them can be tough: so difficult, in fact, that a major part of the Cult of Laverda involves working on them yourself. So back to the “rare” part. Imagine my surprise when, browsing eBay (so you don’t have to), populating my own fantasy garage, I found two of them for sale at the same time. 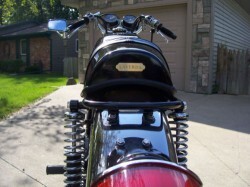 The first is a little bit custom, with a shortened tail and non-standard bars. 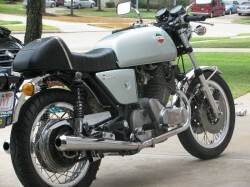 This is an Italian made 1974 750cc Laverda Caffe style Motor Cycle, completely rebuilt including the motor and and drive train. The paint is black onyx with a clear coat. This is a near perfect show bike with approxamently 100 miles on, its won several trophies and has always been stored inside. 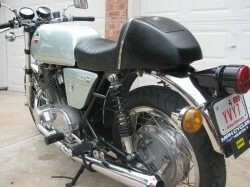 Runs very well and comes with manuals, several books and owners club magazines. 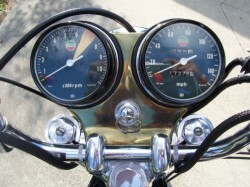 The mileage is listed at 17,381, pretty low for a 37 year old motorcycle. The second ad has quite a bit more history, including details of work and modifications that have been done and a list of “GOOD” and “NOT SO GOOD” things to consider before purchase. 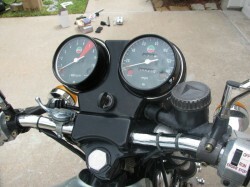 The list of “GOOD” is much longer: the bike is listed as having 9800 miles and has been obsessively maintained. I took it this bike to California for the Laverda owners meeting where Piero Laverda selected it as the best 750 SF special (I had clip on and rearsets at that time). After few months it started showing some rust, I hate rust so I did a second restoration. I zinc plated every nut and bolt, I changed the wheel spokes and the front brake rotors to stainless steel and I painted it from blue to yellow. I took the bike to the Luckenback vintage show and the bike won the first prize in the category. (Both prices will go with the bike new owner if wanted). One year later I painted her again to the color in the posted pictures. It runs very well. Not 100% original, but I have all the parts in perfect condition to make this bike 100% original. With very little effort this could be a show bike. 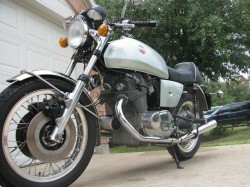 Laverda began making big, parallel-twin bikes in the late 60’s that were known for their overbuilt reliability. Well-engineered and heavy, stable and fast, they made a name for themselves in endurance racing. The 750cc parallel-twin motor produced about 60hp, propelling the bike to a 112 mph top speed and the bike weighed about 500 lbs fully fueled. 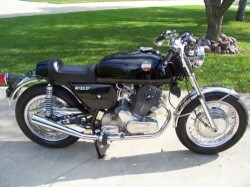 Early bikes sported Laverda’s own massive front drum brake that gave the Super Freni (“Super Braking”) its name and the black bike has this beautiful item. 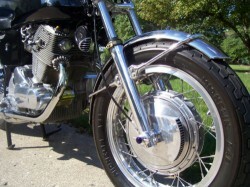 The second is equipped with the later twin discs. Each bike has a different character, but both are in excellent shape. I’d be happy to own either of them.